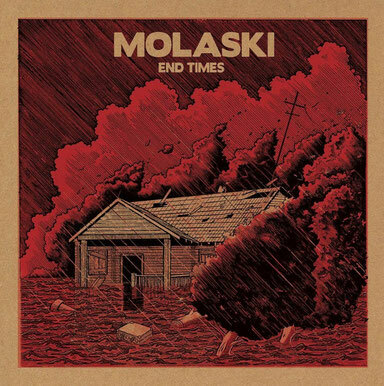 MOLASKI dwell somewhere between drunken midnight jazz, howling piano blues and the beaten beauty of old country - with the rhythmic power of an upright bass and a strumming guitar, a pumping piano and a rough and raspy voice. ’End Times’, the German trio’s first record, is a collection of final chapters and closing doors, a broken and romantic album full of stories about drinking, drugs, death and divorce, about the paint slowly peeling off of life. Menacing tangos, slow-waltzing tales of lost love and loneliness, weeping banjo-driven tunes, dark back-alley blues and country laments make up the stripped-down sound of ’End Times’, an album that captures the band’s raw and direct live performance and evokes the dirt, the dust and the darkness. Honest and beautifully derailed music for lovers and goners.